A dialogue among four female voices dating to between 1140 and 1943 about flowing and streaming, about great cosmological images dealing with the relationship between the creator and the creation, but also the creativity of human beings. 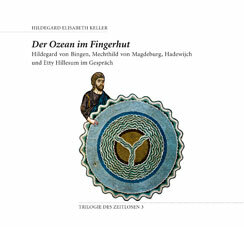 “The Ocean in a Thimble” consists of a documentary book (224 pages). Each of the four principal figures is the subject of a biographical chapter about their life and work. Further chapters are dedicated to the concept of the soul, the cosmology and metaphors of the flowing of water and eroticism between God and man. 32 pages of color plates display medieval manuscripts (including many images from the visionary works of Hildegard of Bingen) as well as photos of Etty Hillesum and her surroundings. The audio play, “The Ocean in a Thimble”, which is included with the book, brings the four women together in a discussion that takes place outside of time. The play familiarizes listeners with the life and work of the four women. The foundations are provided by the visions and letters of Hildegard of Bingen, the “Flowing Light of the Godhead” by Mechthild of Magdeburg, the visions and letters of Hadewijch, as well as the diaries and letters of Etty Hillesum from the years 1941-1943. The audio play features the voices of Mona Petri, Chantal Le Moign, Nikola Weisse and Hildegard Elisabeth Keller, along with improvisations on the oud by Mahmoud Turkmani. Trilogy of the Timeless: Documentary book and audio play are complementary: the first is a book to be read and to be seen, the other opens up an inner world through hearing. The trilogy first appeared in the context of the exhibition, “Mysticism – Yearning for the Absolute” in the Museum Rietberg, Zürich (September 23, 2011 – January, 15, 2012).